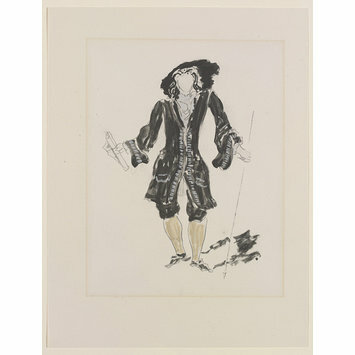 As part of the Diaghilev Ballets Russes 1924 French Season, Moliere’s comedy-ballet Les Facheux was staged. The ballet was premiered at Monte Carlo on 19 January 1924, with music composed by Georges Auric and choreography by Bronislava Nijinska. Georges Braque carefully designed his costumes so that when the dancers turned their backs they would fade into the setting. Nijinska’s choreography took little advantage of this device which was more fully realised when Léonide Massine restaged the work two years later. This is one of four plates from a deluxe volume on Les Facheux, published in Paris in 1924. The plates show costumes for Gossips (front and back), a valet and Lysandre, the dancer. 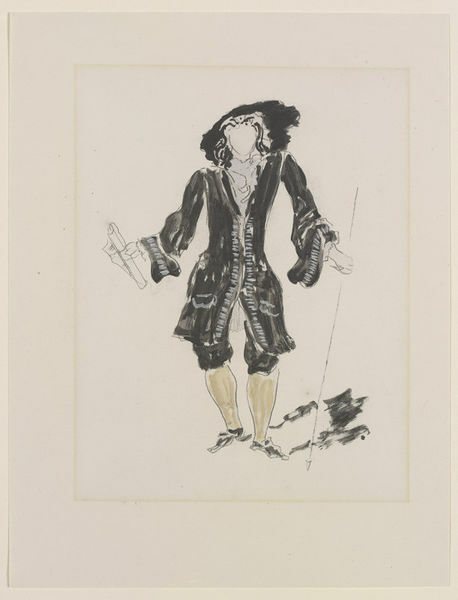 Costume design by Georges Braque, Les Facheux, Diaghilev Ballets Russes, 1924. Lithograph with gouache highlights.